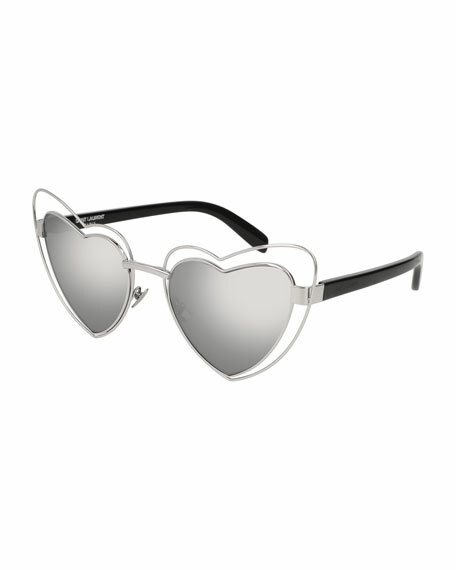 Saint Laurent "Lou Lou" heart-shaped sunglasses. Barton Perreira "Espirutu" sunglasses in titanium. Lens/bridge/temple (in mm): 61-15-145. Gradient butterfly lenses. Adjustable silicone nose pads. Thin, wire arms. Barton Perreira "Espirutu" sunglasses in titanium. Lens/bridge/temple (in mm): 61-15-145. Gradient butterfly lenses. Adjustable silicone nose pads. Thin, wire arms. Capped ear pieces. 100% UVA/UVB protection. Frames handmade in Japan. Pared Eyewear square sunglasses in acetate. Signature OBE rubber-dipped screws for durability and longevity. Monochromatic CR-39® lenses. Notched temples and frame front. "P" inlay at tips. 100% UVA/UVB protection. Imported.